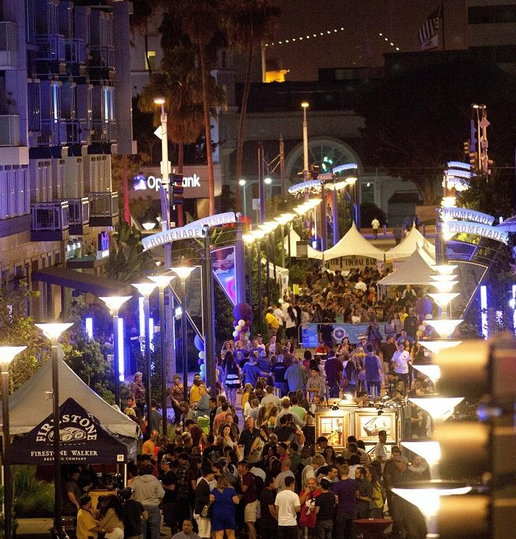 Nearly 2,700 people descended upon Downtown Long Beach’s Promenade for the annual Beer & Wine Festival hosted by the Downtown Long Beach Associates (DLBA), marking the event’s most successful outing to date. 21 breweries, 19 wineries, and 19 restaurants invaded a two block stretch of the Promenade between 1st and 3rd Streets, with passersby vying for tickets after it was announced shortly after opening that the event was entirely sold out. Between sips of Noble Ale Works’ Oktoastyfest Märzen and servings of Bo-beau’s fetuccini alfredo with duck confit, between the sounds of RIOT Stage and those of the infectious pop-rock outfit The Moderates, it was clear to see why those who were unable to score a ticket wanted in on the gastronomical amusement. Her dream may not have veered far from reality since the event’s brew tasters hailed from all over SoCal—from Orange County to the Inland Empire, from Los Angeles to San Diego—to tackle the thirst-driven challenge that is unlimited beer and wine tastings. Could the festival grow even larger next year, perhaps south of 1st? “We are always looking for opportunities to expand,” said DLBA CEO and President Kraig Kojian.